Bon Appetit (Stephanie): The advent of spring is celebrated throughout the pages of Bon Appetit with recipes highlighting ingredients like asparagus, radishes, peas, strawberries, leeks. After the long winter months, it's such a pleasure to cook with fresh seasonal produce again. So many recipes sounded tempting: Garganelli with Asparagus, Artichokes, Favas, and Peas; Soba Noodle Salad with Salmon and Asparagus; Radish, Arugula, and Red Onion Salad with Tangerines; Orange-Flower Pavlovas with Strawberries; Bacon and Leek Risotto with Poached Egg; Ginger-Pecan Scones. Doesn't all of that sound springy and delicious?! My pantry ingredients enticed me to make the Chickpea Salad with Lemon, Parmesan, and Fresh Herbs. I didn't have the fresh parsley or basil on hand, so I did substitute 1/2 tsp of the dried herbs, though I'm certain fresh would have been better. Still, this made a nutritious, delicious, inexpensive lunch. I served it on a bed of shredded romaine. This will definitely become a standby recipe. 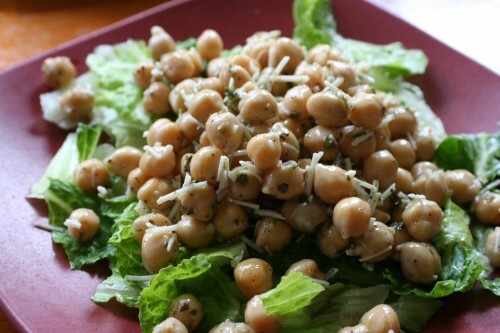 Combine rinsed and drained chickpeas, chopped fresh basil, chopped Italian parsley, fresh lemon juice, extra-virgin olive oil, and pressed garlic clove in medium bowl. Add grated Parmesan cheese and toss gently to blend all ingredients thoroughly. Season chickpea salad to taste with coarse kosher salt and freshly ground black pepper. DO AHEAD Chickpea salad can be made 4 hours ahead. Cover and refrigerate. Serve salad chilled or at room temperature. 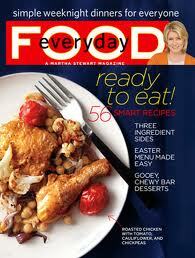 ﻿ Everyday Food (Stephanie): Every couple of months I get my hands on an issue of Everyday Food, and while I'm not wowed by every page, there are always several recipes that pique my interest. In this issue I did find recipes I hope to try sometime: Sauteed Collards with Bacon; Raspberry Cornmeal Crumble Bars; Shredded Chicken with Kale and Lentils; Mushroom Risotto with Spring Herbs. Overall though, I felt like a Celebration of Spring theme seemed rather absent (other than the Easter Dinner menu: Salmon with Brown Sugar and Mustard Glaze; Salt and Pepper Rolls; Asparagus and Green Beans with Chili-Orange Oil; Balsamic Red Onions; Simple Lemon Cake). 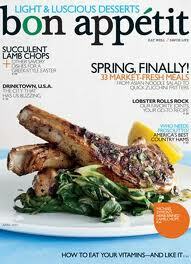 I would have enjoyed more lightened-up, spring produce featuring recipes. We don't eat much cereal in our house, but I love a bowl of granola now and then. 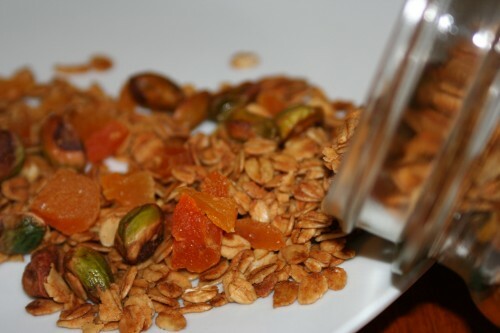 So, I decided to try two variations of granola recipes: Pistachio-Apricot Granola and Cherry-Lime Granola. Both were quite tasty! (Though I didn't have enough of the lime zest, so the lime flavor didn't come through as strong as I would have liked.) 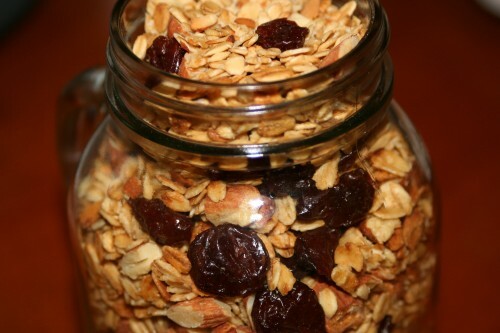 I make my granola with Bob's Red Mill Gluten-Free Rolled Oats, so my husband can enjoy the bounty as well. These recipes are a little on the pricey-side as the nuts and dried fruits can be expensive, but it's fun to experiment with different flavors. The basic quantities are endlessly adaptable to your pocketbook and palate. Pour butter mixture over oat mixture and toss until oats and nuts are completely coated. Transfer to a parchment-lined rimmed baking sheet and spread in an even layer. 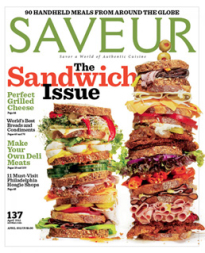 Saveur (Alaina): This is consistently a great magazine full of information and great recipes. They nearly always include international recipes which I really like. 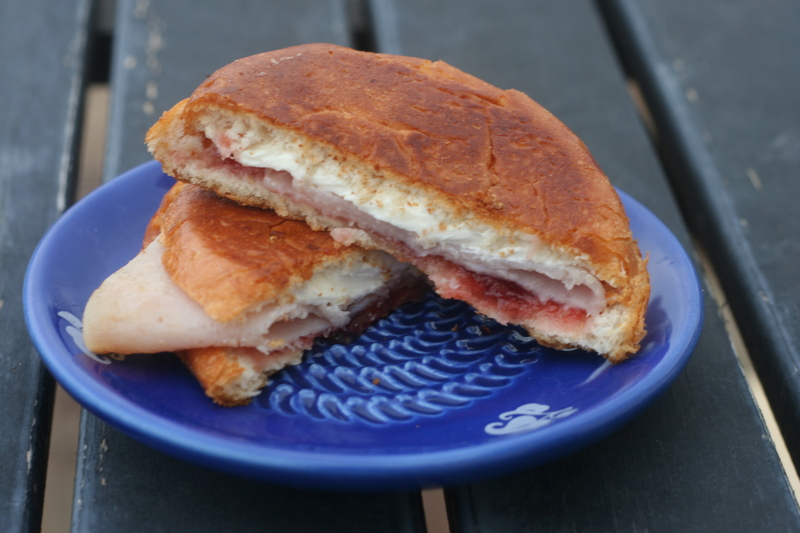 Sandwiches was the tantalizing theme of this month's issue. You may recall, that I am crazy about sandwiches. So, of course, I had to feature this magazine in the review. I made two of the over 40 sandwich recipes. It was a little hard to narrow it down! They were quite different but both were popular with my crew. Whisk together buttermilk, sour cream, mayonnaise, chives, parsley, and garlic and onion powders in a small bowl. Season with salt and pepper, and spread on all bread slices. 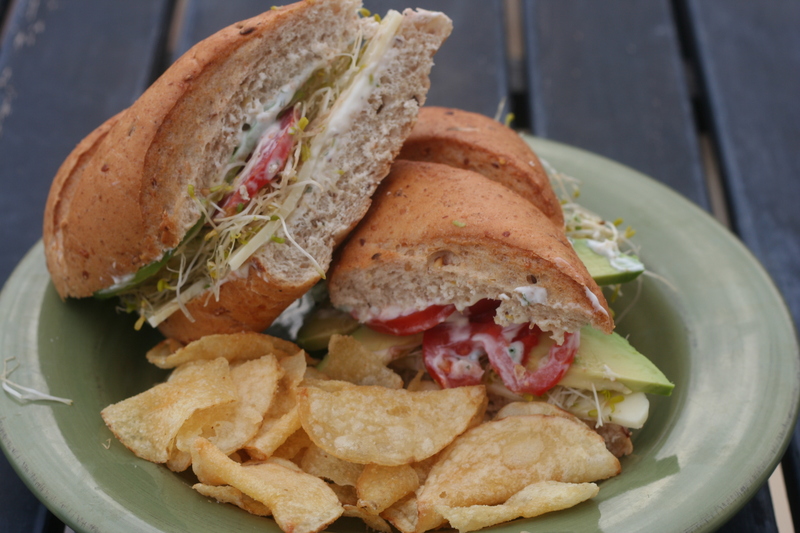 Place 1 slice cheese each on 2 slices of bread and top with sprouts, avocado, and tomato. Season with salt and pepper, and cover with remaining 2 slices of bread.